You are a giant robot. 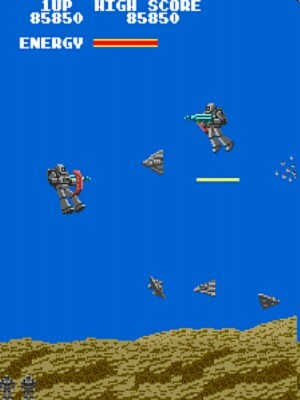 Fight non-stop waves of enemies. Your shield will stop energy blasts but not collisions. Warp : When you reach the second radar that pops up from the ground, after you landed the first time and gone though the forest, put your shield on and go directly into the laser firing turret. You should activate a warp to the second spaceship!